Preparation time: 10 minutes. Cooking time: 5 hours. 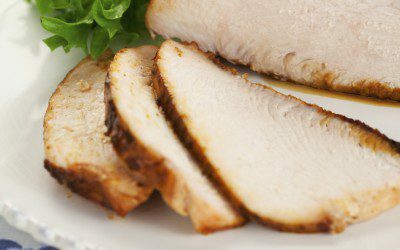 Place turkey breast in Crock-Pot, lift skin, and sprinkle with salt and pepper. Do not add any liquid to Crock-Pot. Cover Crock-Pot, and cook on high for approximately 5 hours, or until breast is tender and cooked through (cooking time will be increased if lid is removed frequently). Remove skin and bones and discard. Return turkey to Crock-Pot to keep warm. Whisk together pineapple juice, brown sugar, soy sauce, and cornstarch in a small saucepan. Place pan over medium-high heat and whisk constantly until thickened just slightly (about 2–3 minutes); sauce thickens more with cooling. Remove turkey from Crock-Pot, drain off juices, slice turkey onto serving platter, drizzle with pineapple sauce, and serve.